1) It is significant Sefolosha even went to trial. Several NBA players have been arrested in similar circumstances over the last decade: instances where police arrested them without cause or used pepper spray or tasers to put them down. Usually these cases are settled quietly in the name of mutually beneficial public relations. But Thabo Sefolosha risked his freedom and livelihood in an effort to clear his name. This speaks to his own character as well as the moment in time in which we are living. There is simply less tolerance for unchecked police aggression. 2) Thabo Sefolosha received justice, but the system remains unjust. 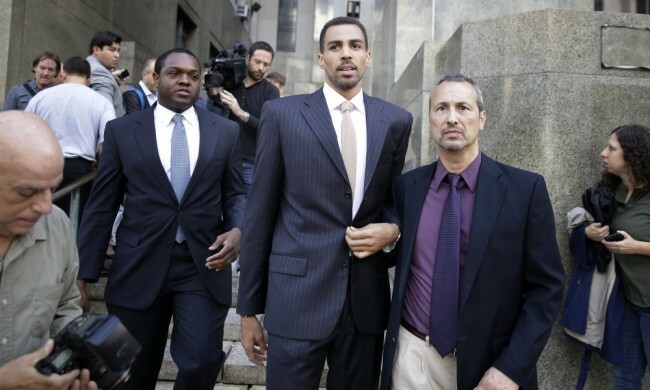 Sefolosha was able to fight back because he could afford competent attorneys to find witnesses and mount a defense. Most people hurt by the police and then charged with crimes for their troubles lack the resources needed to beat the system. In addition, these officers were found to have broken a man’s leg without cause, but no one expects them to be prosecuted, lose their jobs, or even be placed on leave. They essentially exist in a lawless, unchecked space. 3) There is a frightening mentality in the New York district attorney’s office. Assistant DA Francesca Bartolomey closed her case with two arguments. The first was, “The defendant doesn’t get to say where the crime scene ends.” In other words, even though Thabo was far down the street from where a stabbing took place, the police had the right to physically accost him for not moving quickly enough. The second was when Bartolomey said, “Imagine a world where we are allowed to say no to an officer. It would be chaos.” Dear Lord. Imagine a world where you are not allowed to say no to a police officer. 4) The NYPD has a racism problem that was just proven in open court. One of the least covered aspects in this trial was that Thabo’s lawyer had surveillance footage of the initial approach by police. They are seen passing Thabo’s white teammate Pero Antic and making a beeline for Thabo. He was in their sights. He was their target. His skin was a bull’s-eye. Read Zirin’s entire piece at The Nation.